The Guardian has run a couple of pieces on discontent with shortcomings of standard economics and movements for 'alternative' approaches lately - see here and here. I can understand some of the frustration, but think the conclusion of rejecting standard technologies is misplaced. Exhibit #1 - The Guardian also just ran this piece by Saez and Piketty arguing for very progressive policies but relying for its analysis on very standard mathematical techniques. According to this story in The New York Times, The Metropolitan Museum of Art has signed a new lease giving the museum the prerogative to set admissions fees. Admission currently is governed by 'recommended' fees that leave actual amounts paid by visitors up to the visitors themselves. While the institution claims it has no plans to alter the admissions policy, any move to increased fees would fall hardest on those least able to pay. 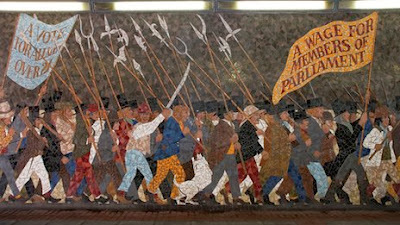 And here at Creative Time you can find this brief interview with Rebecca Solnit focusing on art and the political economy of American cities. Finally, this pointed essay from Jacobin on the ironic amnesia that afflicted Barack Obama when he asked whether people who wanted a raise could simply shut down the company if the boss refused. "The poll . . . shows libertarians identify much more with the GOP (43 percent) than with the Democratic Party (5 percent), but half identify with neither party. The libertarian movement is largely homogeneous. It is strongly non-Hispanic white (94 percent), young (62 percent under 50 years old) and male (68 percent). In other words, they are a modestly expanding part of a shrinking portion of the voting population. Perhaps they are too busy paying attention to themselves and their "freedom" to notice. 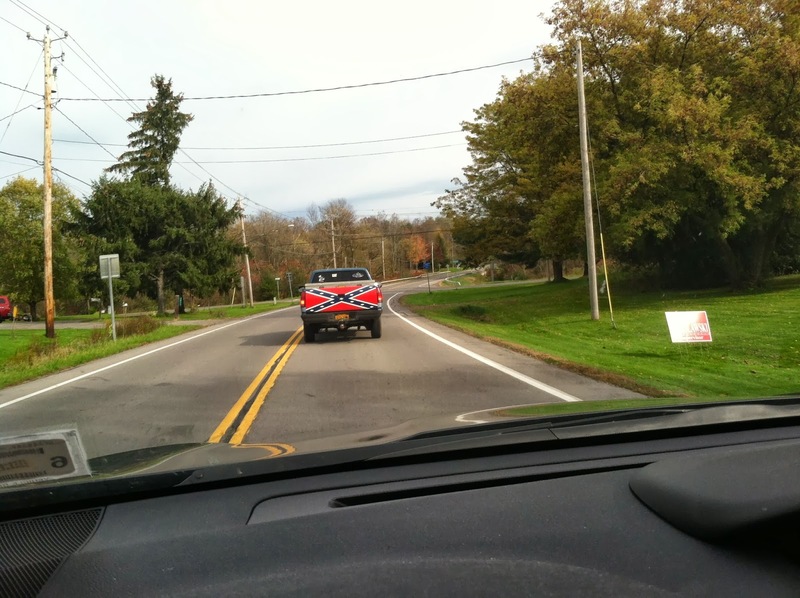 Confederate Flags and Cluelessness Revisited at the University of Rochester. I do not follow the UR CR (or anyone else) on Twitter. This was sent to me by a recent alumnus. Make that an irritated recent alumnus. But a couple of questions arise in all this. These press photos depict white students - usually, you'll note, white boys - acting out at the universities of Georgia, Mississippi and Alabama respectively. 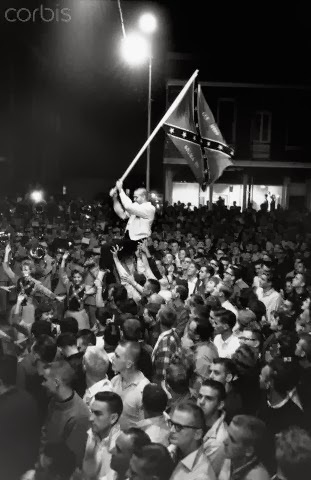 In short, the confederate flag is indeed a symbol of the "Southern identity" and that identity is thoroughly inflected by racism. It is disingenuous to suggest otherwise. If the College is meant to be self-governing, and if it is (rightly) protective of the free speech necessary to academic freedom, what we need on campus are forums (workshops, teach-ins, etc.) to address the sorts of conflicts the University now confronts. We are working on it. * Owen Fiss. 1996. The Irony of Free Speech. Harvard UP, page 3. ** Correction: I have been informed that the student in question lives in a house on the fraternity quad, but that the house is not a frat house and that the student is not affiliated with any fraternity. This is the announcement (pdf here) of an outdoor exhibition, coordinated by the Princeton University Art Museum, of "Untitled" works by Felix Gonzalez-Torres. The works are dispersed on a dozen billboards around New Jersey. Lou Reed has died according to this report at Rolling Stone. 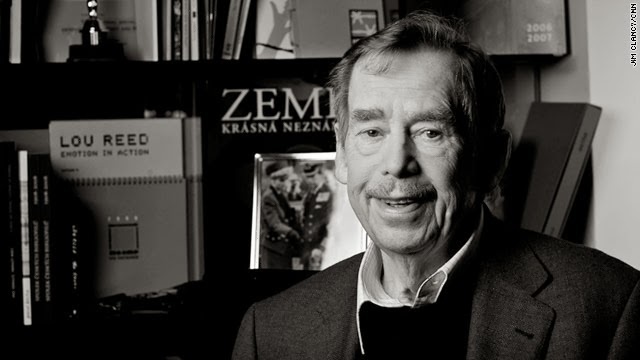 Obviously, the image here is Václav Havel, not Reed. But note on Havel's bookshelf is Lou Reed: Emotion in Action ( a collection of Reed's photographs). "Again, the data that there is no correlation between cuts in top tax rates and average annual real GDP-per-capita growth since the 1970s. For example, countries that made large cuts in top tax rates, such as the United Kingdom or the United States, have not grown significantly faster than countries that did not, such as Germany or Denmark. What that tells us is that a substantial fraction of the response of pre-tax top incomes to top tax rates may be due to increased rent-seeking at the top . . . rather than increased productive effort." The upshot of this, economists Emmanuel Saez and Thomas Piketty argue here, is that once avoidance strategies are contained, a remarkable rise in tax rates for the rich is plausible fiscal policy. This would be good not only for addressing worries about deficits but, as Saez and Piketty suggest glancingly at the very end, for democratic politics. Art critic and philosopher Arthur Danto has died. I have engaged with Danto here several times. There is an obituary here at The Art Newspaper. More to follow as they appear. Fashion photographer Deborah Turbeville has died. An obituary appears here at The New York Times. Recently, The New York Times ran this Op-Ed defending the scientific status of economics on grounds that members of the profession share a "profound agreement in their scientific approach to economic questions, which is characterized by formulating and testing precise hypotheses." It comes on the heels of this earlier offering at The Times that argues to the contrary: "The fact that the discipline of economics hasn’t helped us improve our predictive abilities suggests it is still far from being a science, and may never be. Still, the misperceptions persist." And today Paul Krugman argues in this post on his blog at The Times that while economics may, in fact, closely approximate a science, not all economists act like scientists in the sense of revising their views in the face of cogent counterarguments or dis-confirming evidence. There are at least two complicated themes in all this. The first is whether we want to reduce our assessment of whether some mode of inquiry is scientific to a one dimensional matter of empirical performance - interpreted in terms of hypothesis testing or predictive success or whatever. I think the answer to that is simple - no. The second is how social inquiry is entangled with politics in particular and with evaluative concerns more generally. Typically this entanglement is intricate, making the question of how to act like a scientist difficult to discern. But in the case of political economy where there are large material and ideological stakes, that is perhaps even more difficult to see. At the University where I teach there was an unpleasant incident last week in which a resident of a fraternity displayed a confederate flag in his window. Members of the Douglass Leadership House (which happens to be on the fraternity quad) took offense and spoke out in a frank but, I think, reasonable manner. (Full disclosure: I am faculty adviser to the DLH students.) 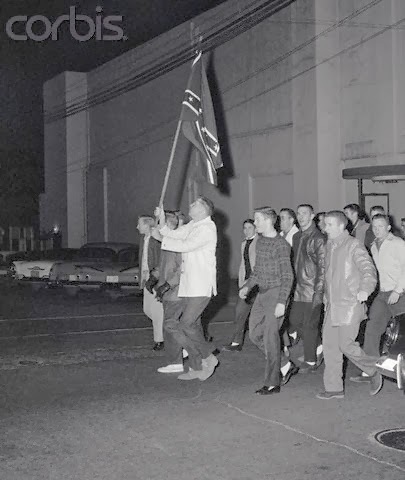 In the subsequent exchange on Facebook some students sought to defend displaying the flag as simply a symbol of southern culture, denying that - past or present - it has any racist connotations. Others dropped the pretense and engaged in truly outrageous statements expressing nostalgia for the days of slavery. And, of course, everyone invoked free speech. But, of course, the students in DLH simply spoke back. This episode plays out in different ways in other contexts. I snapped the photo above with my iPhone while driving in our small western NY town this afternoon. 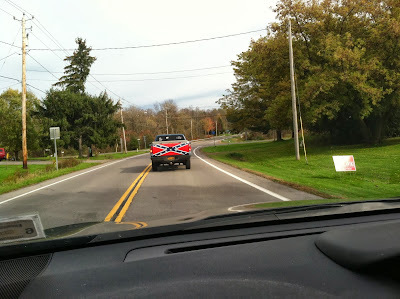 Two young men were cruising in their pickup. And, of course, there was the rebel display at the White House last week (see here and here). Of course, there is no racism on display in any of that - at least as long as white boys get to define what falls into that category. I see two possible explanations for the behavior of young white men displaying the confederate flag. Some may actually be racist. Saying so typically elicits howls of protest from those so described. Others, though, may just be clueless. It is in no way obvious that the latter possibility is any less objectionable than the former. * Michael Suk-Young Chwe. 2013. Jane Austen, Game Theorist. Princeton University Press, page 222, 224. I've not actually seen this (initial, I think) installment of The Best American Infographics but I intend to track it down. A great idea. Why? Because instruments for communicating quantities are centrally important to both social science and democratic politics. (On this see Dewey, The Public & Its Problems (1927), especially the end of chapter five.) And so, becoming aware of strong practice in this domain is crucial. I noticed that the Roosevelt Institute had given its bi-annual Four Freedoms Awards for 2013. I am not terribly impressed by awards of this sort. They typically recognize individuals who make some kind of humanitarian contribution whether those individuals be political leaders, clergy, journalists, human rights advocates or whatever. Nothing wrong with that. But the focus tends to be on individuals. And the emphasis tends to be on humanitarianism (which I take to be an ethical stance) not politics. This year, along with a set of deserving individuals the folks at the Roosevelt Institute have surprisingly given the award to the Coalition of Immokalee Workers an organization of workers that presses campaigns for fair wages, improved working conditions, and so forth. In the process they contribute to the empowerment of workers in ways that most liberal foundations go out of their way to avoid. Political theorist Nancy Fraser here at The Guardian on how feminism is complicit in the reign of neo-liberal policies and institutions. Economist Joseph Stiglitz here at The New York Times on choosing political economic inequality and the consequences thereof. Both pieces, it seems to me, underscore the priority of democracy. While polities face options, they do so in ways that privilege those individuals and groups who already enjoy resource asymmetries. Hence our 'choices' hardly have been democratic in any plausible sense. In The Guardian today you can find this brief, smart essay on the possibility of using photography to pluralize our views of women - in this instance women who've just given birth. The essay rightly notes the vicissitudes of this task - both the narcissism of celebrities and the re-working of tired tropes. But the basic message - "When images of breastfeeding and postpartum tummies enter our popular culture, they will help to provide a path away from ignorance and embarrassment." - seems on the mark to me. And, of course, as I noted earlier today this is a timely topic in our household! Democracy requires the capacity of publics to engage in political protest. That in turn requires some official recognition of the civil and political rights of protesters. A new report compiled by International Network of Civil Liberties Organizations (INCLO) - Take Back the Streets: Repression and the Criminalization of Protest Around the World - suggests just how precarious such recognition has become across the globe. The report is "a collaborative effort on the part of nine domestic civil liberties and human rights organizations: the American Civil Liberties Union, the Association for Civil Rights in Israel, the Canadian Civil Liberties Association, Centro de Estudios Legales y Sociales, the Egyptian Initiative for Personal Rights, the Hungarian Civil Liberties Union, the Kenyan Human Rights Commission, the Legal Resources Centre, and Liberty." 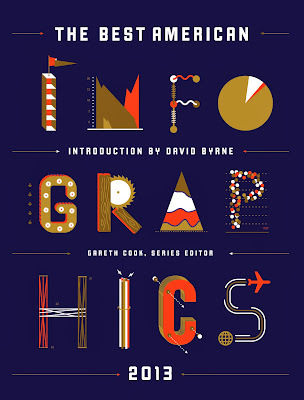 You can find a copy (pdf) here. 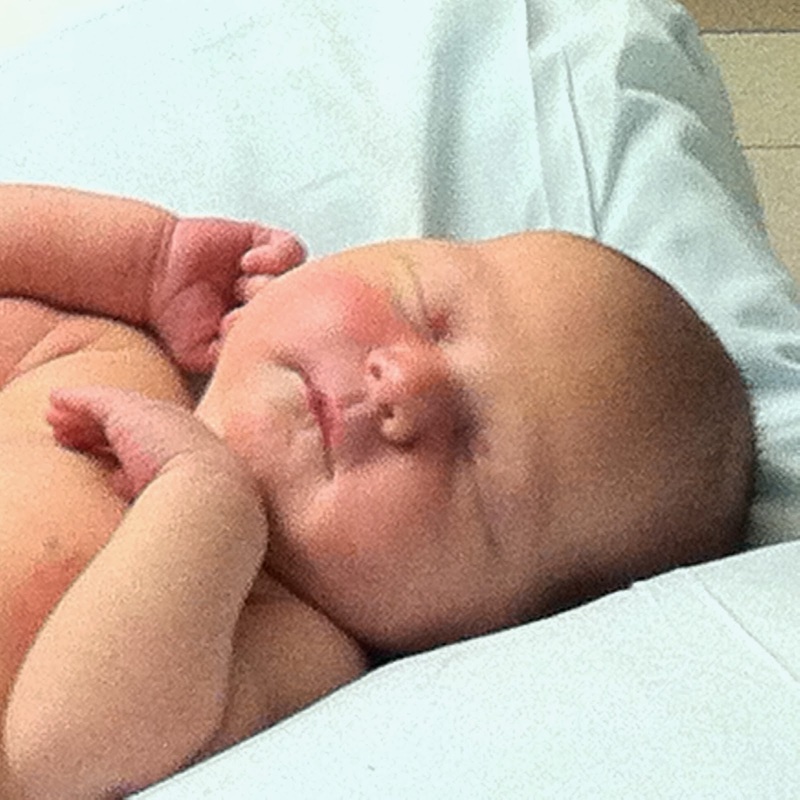 Even given my meager photographic skills you can see that our new daughter is beautiful. Esme was born about 2:00 am EST on the 10th. The labor was difficult but Susan is doing well. Esme has been a long time arriving. Susan and I are tickled. I used to label my posts about the kids "my boys"; now I'll need to come up with another label. Political Economy: An Op-Ed here from Dani Rodrik on comparative - and inauspicious - patterns of de-industrialization in developed economies and another here by Joseph Stiglitz on the unimpressive economic 'recovery' in the US. Art: A really nice feature here in The New York Times of William Kentridge discussing the work of an Indian artist, Nasreen Maohamdi, about whom I knew nothing until this afternoon. 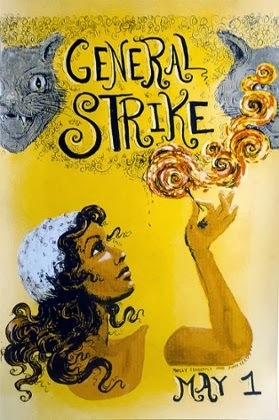 General Strike Match (2012). Molly Crabapple/John Leavitt/Melissa Dowell. In a truly depressing development, The Guardian reports that the Museum of Modern Art (MOMA) has acquired a collection of posters and prints from the Occupy movement. The works had been part of a collection at Occuprint. Several things make this depressing. Most obviously, the posters not only have now been converted into private property but that this has happened in an 'of course,' 'isn't that great' sort of way. But I think this acquisition is symptomatic of the absence of just the sort of public space and just the sort of alternative institutional frameworks that - in large measure - the occupiers hoped to establish. It underscores both the continuing importance of the themes OWS articulated and it's lack of immediate impact. Moreover, it is especially ironic - given some initiatives among the Occupiers themselves - that MOMA is absorbing the collection. This is as staid an institution as there is in NYC. It is the epitome of the "money laundering" function that cultural institutions of play for the wealthy. Posters and prints generated out of a movement of, for and by the 99% are being squirreled away by an institution whose history is, I suspect, intimately entangled with the 1%. Finally, there are alternatives. Those alternatives are not perfect. Nor are they entirely inspiring in political terms. But they do not - as artist Molly Crabapple disingenuously suggested to The Guardian reporter - come down to selling off the collection to Morgan Stanley or some other corporate entity for display "in their lobby." I am hardly an expert on such matters. But it took me nearly no time to think of a counterexample to that rationalization. Consider ACT UP - a more or less direct political predecessor of the Occupiers. The ACT UP - NY archives went to the New York Public Library. The NYPL is a large cultural institution. But it is public, not private. And it is, I suspect, considerably less entangled with the monied elites than is MOMA. And it surely would look waaay(!) less impressive to all those denizens of the art world who care about such things, for Ms. Crabapple to list on her c.v. that her work is in the collection of the NYPL than to note that it is in the collection at MOMA! The Daily Constitution 1878 (2011) © Kara Walker. "Two years ago, Kara Walker came across a news story in an edition of the 19th-century Atlanta newspaper the Daily Constitution. The year was 1878; the piece described, in excruciating detail, the recent lynching of a black woman. The mob had tugged down the branch of a blackjack tree, tied the woman's neck to it, and then released the branch, flinging her body high into the air. 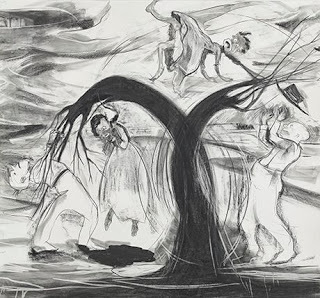 This terrible fragment of the past has made its way into a large graphite drawing ... Like much of her work, the drawing is both beautiful and disturbing: here, in grotesque, cartoonish monochrome, is the blackjack tree, the lynched woman spilling blood, her assailants laughing as she dies. As I stand and stare, Walker tells me why she was so drawn to the story. 'It's this completely absurd, extreme, violent situation that required so much perverse ingenuity.'" "The obvious question is why did he – and she – do it? When asked, Ledare can retreat into a mixture of conceptual art speak, as in "the extremely open and intimate relationship I have with my mother ... was developed through the work. (It) comments on the confusion around these sexual boundaries … through imposing herself on me as a subject, she was asking me to be complicit in her sexualisation. 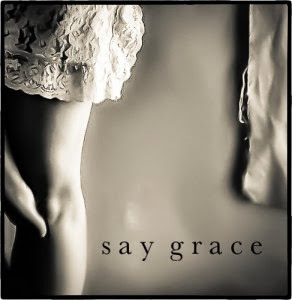 I saw her sexuality as a means of antagonising her father and refuting expectations he had for how she should behave as a mother, daughter, and woman of her age." His decision to chronicle his troubled relationship with his mother, he says, started when he returned home one Christmas. "I arrived home not having seen her for a year and a half," he recalls. "She knew I was coming and opened the door naked." When Leigh walked in past the bedroom, "a young man, almost exactly my age, was sprawled out naked. He rolled over to see me, saying hello, before rolling back over and returning to sleep." Ledare interpreted this welcome as "her way of announcing to me what she was up to, at this period in her life – almost as though to say, 'Take it or leave it.' I had a camera and began making photos of her then. She was the catalyst." So, in the event Ledare ought to have turned and walked away and then found a therapist. Instead he reached for his camera, then learned art-speak and psycho-babble to justify his ongoing lapse in judgement. Let's say - in case you have not guessed - that I am unimpressed. Indeed, I don't think one can even say this is a case of wasted talent. 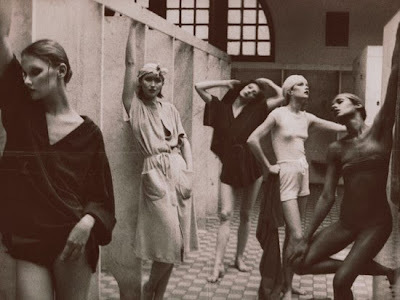 Is Photography Un-Islamic? A Tool for Empowering Women? Both? Yesterday, I posted on an exhibition currently up at the Museum of Fine Arts (Boston) - "She Who Tells A Story: Women Photographers from Iran and the Arab World." I then came across this story at The Times of India about struggles over photography among Muslims. On the one hand we have an Islamic Seminary (Darul Uloom Deoband) pronouncing photography 'un-Islamic'; and on the other hand a women's group (Aawaaz-e-Niswaan - see their photography workshop web page here) actively training women in photography. If we take a fundamentalist view of Islam (or, frankly, nearly any other religion) the answer to the questions posed in the title to this post is obvious enough. Historian Lawrence Goodwyn, who did important work on American populism as well as the American civil rights and the Polish Solidarity movements, has died. There is an obituary here at The New York Times. Some elementary statistics made fun and easy by the nice folks here at The New York Times. Untitled #2 (2008) - Photograph © Gohar Dashti. 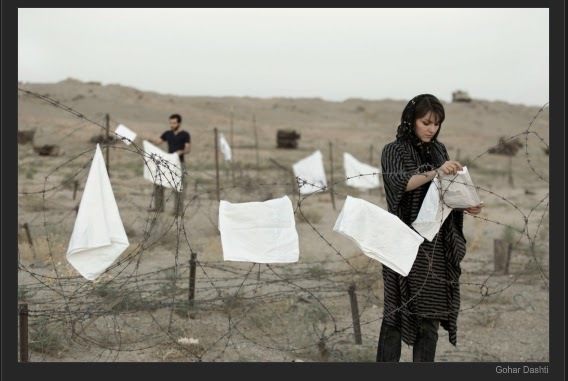 There is a thoughtful, provocative exhibition up at the Museum of Fine Arts (Boston) through mid-January - "She Who Tells A Story: Women Photographers from Iran and the Arab World." It includes work by a dozen women from the region: Jananne Al-Ani, Boushra Almutawakel, Gohar Dashti, Rana El Nemr, Lalla Essaydi, Shadi Ghadirian, Tanya Habjouqa, Rula Halawani, Nermine Hammam, Rania Matar, Shirin Neshat, and Newsha Tavakolian. There is a brief review of the exhibition here at The Economist and another, accompanied by a slide show and including links to many of the photographers' web pages, here at The New York Times. He is the artist I love best in the world: I love his modesty and his resourcefulness, and his willingness to combat oppression and violence with laughter. His work reflects the idea of Milan Kundera, that the machinery of power works by imposing forgetfulness; that the way the individual can fight back is through laughter. 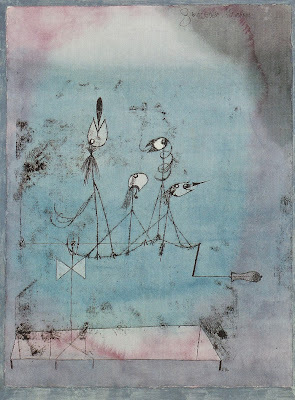 At the time, nothing could have seemed more fragile and pointless a gesture against the armies of Hitler than a painting of fish, gawping at each other, by a Dessau art professor. But nothing remains of Hitler's power, and the structures he built are mostly dust. What certainly does remain is a little, tender picture of a garden; a sheet of luminous colours; music transformed into an image. 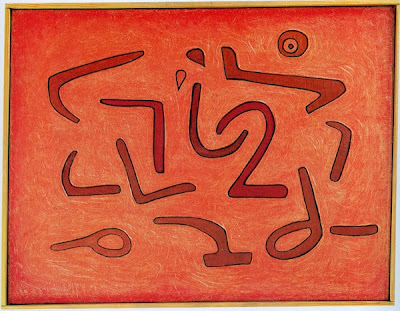 All that may be true of Klee. But Hensher's premise is that Kundera's assessment of our options in the face of tyrants and despots is persuasive. And that, as I've intimated here in the past, is questionable not simply as a matter of philosophical analysis, but of historical experience as well. Elizabeth Warren on "the anarchy gang"
Among the things I am especially interested in are technologies (including but not only photography) for visualizing large-scale, aggregate political phenomena - famine, war, epidemic, migration, etc. Here is a new essay by Rebecca Solnit on the difficulties of visualizing, understanding and confronting yet another "big" thing. Sometimes the fate of the Earth boils down to getting one person with modest powers to budge. The bureaucrat had a hundred reasons why changing course was, well, too much of a change. This public official wanted to operate under ordinary-times rules and the idea that climate change has thrust us into extraordinary times (and that divesting didn’t necessarily entail financial loss or even financial risk) was apparently too much to accept. Hold up your hand. It’s so big it can block out the sun, though you know that the sun is so much bigger. Now look at the news: in column inches and airtime, a minor controversy or celebrity may loom bigger than the planet. 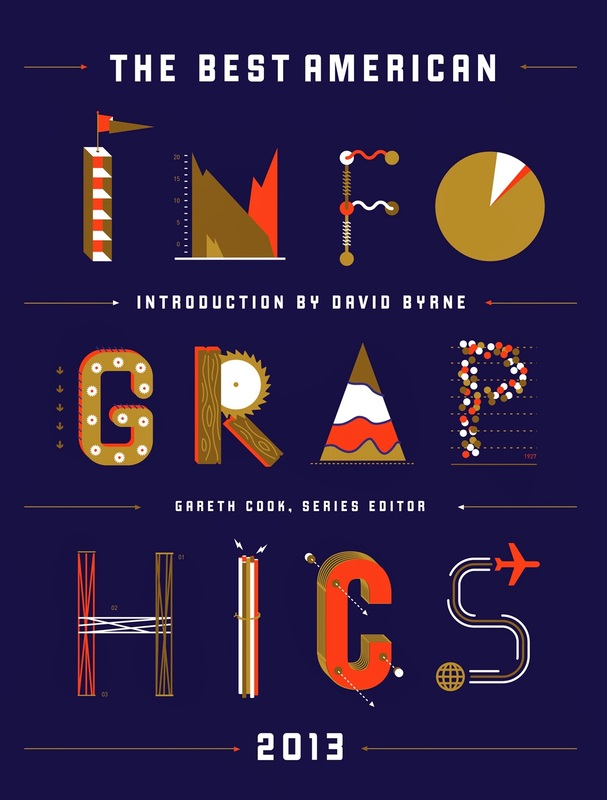 The problem is that, though websites and print media may give us the news, they seldom give us the scale of the news or a real sense of the proportional importance of one thing compared to another. And proportion, scale, is the main news we need right now -- maybe always. Some things are so big you don’t see them, or you don’t want to think about them, or you almost can’t think about them. Climate change is one of those things. It’s impossible to see the whole, because it’s everything. It’s not just a seven-story-tall black wave about to engulf your town, it’s a complete system thrashing out of control, so that it threatens to become too hot, too cold, too dry, too wet, too wild, too destructive, too erratic for many plants and animals that depend on reliable annual cycles. It affects the entire surface of the Earth and every living thing, from the highest peaks to the depths of the oceans, from one pole to the other, from the tropics to the tundra, likely for millennia -- and it’s not just coming like that wave, it’s already here. Given the demands of the task and the muddle of the mainstream media, it's remarkable that so many people get it, and that they do so despite massive, heavily funded petroleum industry propaganda campaigns is maybe a victory, if not enough of one. Not quite a year ago, a climate-change-related hurricane drowned people when superstorm Sandy hit a place that doesn’t usually experience major hurricane impact, let alone storm surges that submerge amusement parks, the New York City subway system, and the Jersey shore. In that disaster, 148 people died directly, nearly that many indirectly, losses far greater than from any terrorist incident in this country other than that great anomaly, 9/11. The weather has now become man-made violence, though no one thinks of it as terrorism, in part because there’s no smoking gun or bomb -- unless you have the eyes to see and the data to look at, in which case the smokestacks of coal plants start to look gun-like and the hands of energy company CEOs and well-paid-off legislators begin to morph into those of bombers. Nowadays glaciers are melting rapidly or disappearing entirely, and some -- those in Greenland, for example -- have gushing rivers of ice water eating through their base. If the whole vast Greenland ice sheet were to melt, it could raise global sea levels by 23 feet. It is almost impossibly scary and painful to contemplate the radical decline and potential death of the oceans that cover 70% of the Earth’s surface and the dramatic decrease of plankton, which do more than any other type of organism to sequester carbon and produce oxygen -- a giant forest in microscopic form breathing in what we produce, breathing out what we need, keeping the whole system going. If you want to read something really terrifying, take a look at the rise of the Age of Jellyfish in this review of Lisa-Ann Gershwin’s book Stung! : On Jellyfish Blooms and the Future of the Ocean. Maybe read it even if you don’t. I hear people who are either uninformed or who are justifying disengagement say that it’s too late and what we do won’t matter, but it does matter, because a rise in the global temperature of two degrees Celsius is going to be very, very different from, say, five degrees Celsius for almost everything living on Earth now and for millennia to come. And there are still many things that can be done, both to help us adapt to the radical change on the way and to limit the degree of change to which we’ll have to adapt. Because it's already risen .8 degrees and that's been a disaster -- many, many disasters. The failure of major food sources, including fishing stocks and agricultural crops, and the resultant mass hunger and instability -- see Syria -- is going to impact the market. Retirees in the beautiful Bay Area are going feel it if the global economy crashes, the region fills with climate refugees, the spectacularly productive state agricultural system runs dry or roasts, and the oceans rise on our scenic coasts. It’s a matter of scale. Your investments are not independent of nature, even if fossil-fuel companies remain, for a time, profitable while helping destroying the world as humanity has known it. Some reliable sources now argue that fossil-fuel stocks are not good investments, that they’re volatile for a number of reasons and due to crash. The IPCC report makes it clear that we need to leave most of the planet's fossil fuel reserves in the ground in the coming decades, that the choice is either to fry the planet or freeze the assets of the carbon companies. Activists are now doing their best to undermine the value of the big carbon-energy corporations, and governments clued in to the new IPCC report will likely join them in trying to keep the oil, gas, and coal in the ground -- the fossil fuel that is also much of the worth of these corporations on paper. If we're lucky, we'll make them crash. So divesting can be fiscally sound, and there is a very strong case that it can be done without economic impact. But the crucial thing here isn’t the financial logistics of divestment; it’s the necessity of grasping the scale of things, understanding the colossal nature of the problem and the need to address it, in part, by pressuring one small group or one institution in one place. That there is a widespread divestment movement right now is due to the work of a few people who put forth the plan less than a year ago at 350.org. The president has already mentioned it, and hundreds of colleges are now in the midst of or considering the process of divesting, with cities, churches, and other institutions joining the movement. It takes a peculiar kind of genius to see the monster and to see that it might begin to be pushed back by small actions -- by, in fact, actions on a distinctly human scale that could still triumph over the increasingly inhuman scale of our era. If there is to be an effort to respond to climate change, it will need to make epic differences in economics, in ecologies, in the largest and most powerful systems around us. Though the goals may be heroic, they will be achieved mostly through an endless accumulation of small gestures. Those gestures are in your hands, and everyone’s. Or they could be if we learned to see the true scale of things, including how big we can be together. Charter 77 emerged as an opposition movement in communist Czechoslovakia; it recently announced that Georgian human rights activist Ales Byalyatski has been awarded the Vaclav Havel Human Rights Prize for 2013. City officials in Newport, Wales have begun demolishing a mural (detail above) commemorating an uprising of Chartists in 1839. (Chartism being perhaps the first modern mass political movement - pressing 'the People's Charter' consisting of radical demands for expanded franchise and political representation.) There has been significant opposition to the demolition. Here is a report from the BBC and here is another from The Independent. A review here at The Guardian of a London exhibition of work by German artist George Grosz, a socialist, whose work captures the despair and mayhem of post-WWI Berlin. 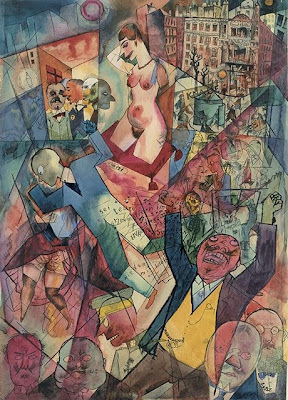 George Grosz ~ Down with Liebknecht (1918). 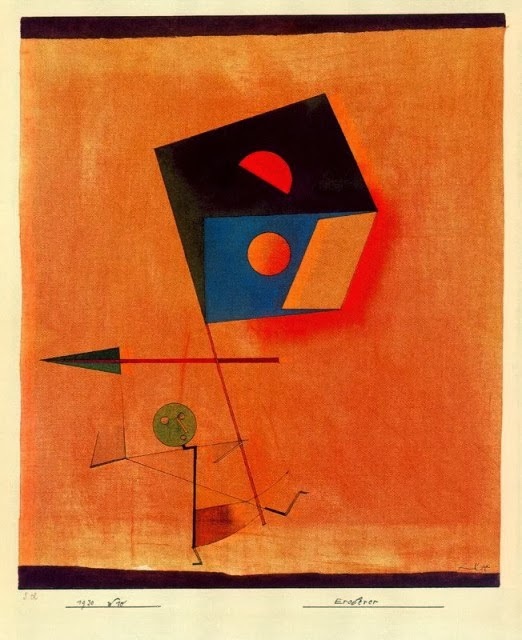 Finally, I recommend this brief blog post at The New York Times by philosopher Alva Noë on the entanglement of facts and values in science generally. That means, by implication, in political science in particular. And, of course, that flies in the face of virtually the entire discipline which still embraces a rigid fact-value dichotomy. Ooops. 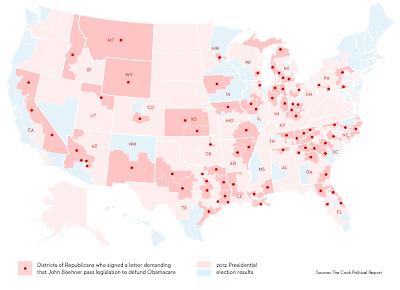 This map locates the districts represented by the "suicide caucus" holding the rest of us hostage. It accompanies this pointed post at The New Yorker. "As the above map, detailing the geography of the suicide caucus, shows, half of these districts are concentrated in the South, and a quarter of them are in the Midwest, while there’s a smattering of thirteen in the rural West and four in rural Pennsylvania (outside the population centers of Philadelphia and Pittsburgh). Naturally, there are no members from New England, the megalopolis corridor from Washington to Boston, or along the Pacific coastline. [. . .] While the most salient demographic fact about America is that it is becoming more diverse, Republican districts actually became less diverse in 2012. According to figures compiled by The Cook Political Report’s David Wasserman, a leading expert on House demographics who provided me with most of the raw data I’ve used here, the average House Republican district became two percentage points more white in 2012. 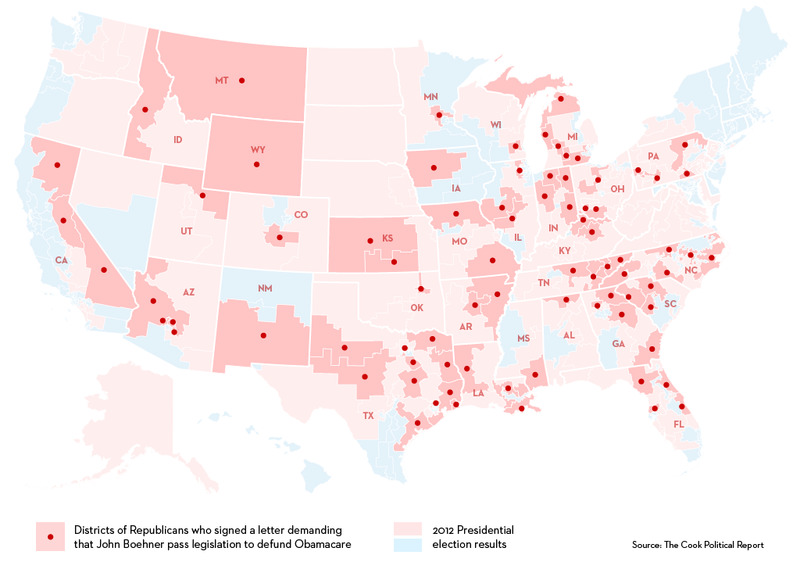 In short, these eighty members represent an America where the population is getting whiter, where there are few major cities, where Obama lost the last election in a landslide, and where the Republican Party is becoming more dominant and more popular. Meanwhile, in national politics, each of these trends is actually reversed."